Why is it right after making a major purchase, a major appliance decides it is time to quit? I smelled something burning this morning, and traced it to the laundry room. I immediately turned off the dryer and investigated, wouldn’t you know, a belt must have snapped in the washer. I was smelling burning rubber. Off I went to the laundromat with a heavy load of soaking wet laundry. I photoshopped the photo. It looks better this way. 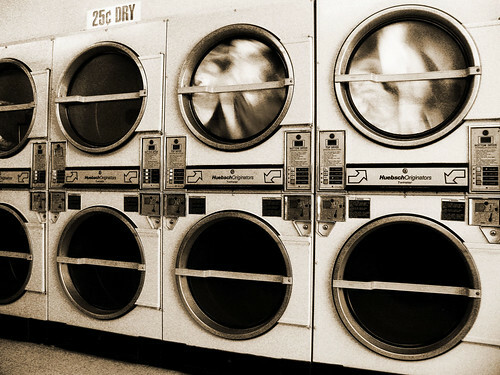 I think it is fun to make new photos look old, especially boring laundromat photos. A new set of appliances is going to be here on Tuesday. I had to go to several places to find ones that could delivered quickly. Best Buy can’t install any gas appliances for two weeks because they are out of the one brand of gas line they carry, even though they had the set of washer/dryer I wanted in stock. So I bought the same set for the same price at Home Depot. Best Buy’s loss. Now for the really big news! This will be my last daily post. I reached my goal of posting to this blog with a photo everyday for a year. 365 posts in 365 days. I am going to take a few days off for a vacation. Then I will be back with news on how a sewing computer works, hopefully it works. This entry was posted on Friday, October 23rd, 2009 at 3:00 am and is filed under Life. Tagged: Life. You can feed this entry. You can leave a response, or trackback from your own site. Congratulations on reaching your goal! That’s perseverance! Ha ha! Yes, the laundromat does look more exciting when it looks vintage, LOL! Congrats for meeting your goal! You did it! Enjoy your bloggy break! I’ve had a few of them! Congratulations from hubby. You are the best. I enjoyed that there was one blog that had a surprise every single day (I didn’t know that it was a 1-year mission). I have a set of 23-year old Maytag washer&dryer. Had the belt replaced in the dryer, now it squeaks and sometimes howls like a banshee when it’s starting up. So far (touch wood) the washer is fine. At the appliance store when I delivered the Autumn Leaves sweater to the owner, she felt that the appliances would die or be expensive to fix (maybe parts not available). As we were speaking, I leaned on the new Maytag, and the sides were “soft” and tinny. I want new appliances that are made like my old ones! I will enjoy your posts about the machine. I don’t intend to even consider one of those expensive babies, because I’m not an “embellishing” sewer, and don’t think it would be worth the $$$ to me. Now if all those features came on a good basic machine, I could learn to play with such a toy. Hello! I am back again! I really enjoyed your comment on my blog! How cool that you have the videos of the “Keeping Up Appearances” series! I think it would be so much fun to watch it with you while you did your needlework and I tatted! It would be fun to live closer! Congratulations! Please take a well-deserved rest–but please come back soon! Congrats on reaching your goal! But don’t be gone too long – really enjoy all your posts and the variety of topics. BTW – I bet we would all like to know about that 25 cents a load price! What a deal! Isn’t Photoshop grand???! That price per load is a far cry from the highest I ever encountered. We were traveling through Alaska a while back and had arrived at North Pole, – dryer load was $5.00 per! Enjoy your new appliances and have a good blog vacation.